On 14 September 2013, Harry Maguire was part of the Sheffield United team that lost 1-0 at Carlisle in League One. Fast forward five years and the 25-year-old Leicester City defender is set to walk out in front of his own club's fans in an England shirt at the King Power Stadium. Maguire has gone from the third tier of English football to the World Cup semi-final in double-quick time. In an interview with BBC Radio 5 live's senior football reporter Ian Dennis, Maguire discusses his meteoric rise as he prepares for his 14th appearance for the Three Lions in a friendly against Switzerland. Maguire spent four seasons in League One with Sheffield United before signing for Premier League Hull City in July 2014 in a move worth £2.5m. He joined the Tigers on the same day they signed left-back Andrew Robertson, now at Liverpool, from Dundee United for £2.85m. Maguire stayed at Hull three years before joining Leicester in a £17m deal. His England debut came against Lithuania last October, and he has just signed a new five-year Leicester contract. "Obviously the last five or six years of football, I do pinch myself," said Maguire. Maguire made his Sheffield United debut aged 18 towards the end of the 2010-11 season. The Blades were struggling in the Championship and were eventually relegated after finishing six points from safety. Over the next three seasons he went on to make 129 League One appearances, and believes he would not have made it as far as he has without the experiencing lower-league football. "To play in League One in every game when I was 18 was massive for my development," he said. "If it didn't happen for me back then, I probably wouldn't be where I am now." Maguire could be excused for allowing his rapid rise go to his head. However, he said his family, friends and agent were all responsible for helping keep his feet on the ground. "I'm really close to everyone. I support them all and they always support me and follow me around the country supporting me every game," he said. "If I do ever get a little bit too big for my boots, they kick me straight back down. I'm a grounded lad and I just look forward to see what's going to happen in the future." 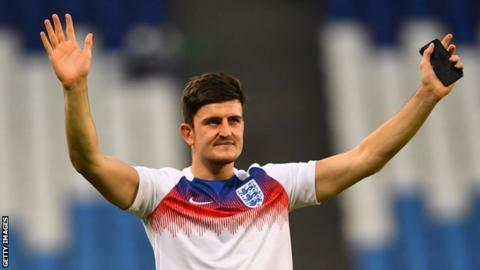 Maguire was involved in all seven of England's games at this summer's World Cup in Russia, scoring in the quarter-final win over Sweden. He has established himself as a key member of Gareth Southgate's team. "You can see what we are building," he added. "He is trying to put his style on the game. The big tournaments are the ones we are going to get judged on mainly.